Oika refers to the essential, underlying intelligence of Nature. This intelligence is ecological and distributed. That means it arises from the relations between things. We are immersed in Oika all the time and can experience it. If we pay attention. But beyond feeling Oika, we can also work with it. Ecological intelligence can be applied as a source of inspiration and creativity in our daily lives and professional pursuits. Engaging with the world through the practice of Oika is not a zero-sum transaction. It is cumulative and mutually beneficial. It feels good to cooperate with Oika because when you align with Nature, the world lets you know by opening up new opportunities. Ecological intelligence is in critical need. Virtually all of the major problems facing humanity arise from a lack of systems thinking. Oika represents a new and ancient way of social adaptation. It can also provide a new career opportunity for those inclined to understand and teach this reality. The mission of Oika Academy is to empower forward-thinking, motivated people to design innovative new career paths that integrate individual and planetary prosperity. 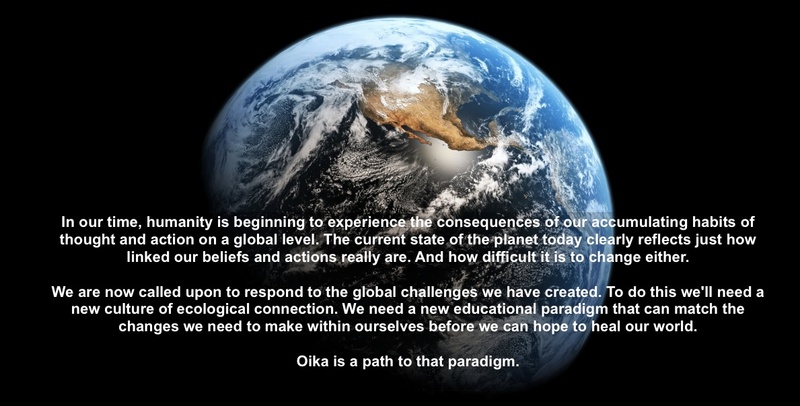 Ecological education of people through a suite of ongoing Oika training programs. Ecological communication in culture through a traveling public-lecture series. Ecological restoration of places through science-based regeneration projects. The word Oika is an adaptation of the ancient Greek work Oikos (the root of the modern word "eco" as in, eco-logy and eco-nomy). Oiko referred to a unification of "person, place and property." But because Ancient Greece was a deeply patriarchal society, the "person" meant the man of the house; the "place" meant the physical house; and the "property" was all the man owned within his house (including his wife, children, slaves and animals). Person - The identity that resides behind the eyes. The intimate, personal, narrative self. Place - The natural, local setting (valley, island, watershed, town, forest, bay etc.) that shapes and guides the "person" above. Practice - The daily activities and practices through which person becomes integral to place. Prosper - An acknowledgement that even an ecological self needs to make a living. All of Oika's evolving programs integrate these four principles (plus a potential fifth, for some, based on Purpose).